Amongst the most brazen of these were the infamous ‘red scares’ – periods of government, media and public hysteria about the communist threat, primarily confined to the USA. Thousands of people were cumulatively arrested and deported under this collection of legislation and environment of toxicity. The first red scare began mere moments after the Revolution took place in Russia; the US State, aided and abetted by the printed press, spread widespread fear amongst the public of communists and anarchists in their midst, cleverly intermingled with xenophobia and an anti-migrant narrative. 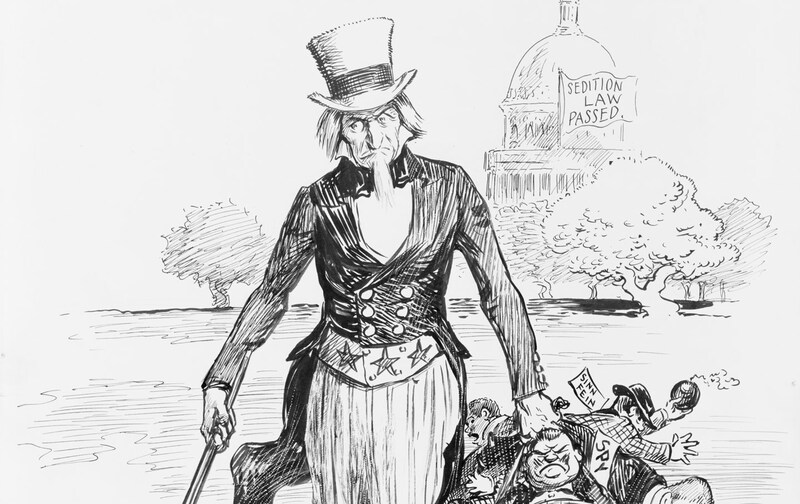 The first result of this was the 1918 Sedition Act which forbade “disloyal, profane, scurrilous, or abusive language” about the US Government, and allowed the US state to refuse delivery of mail believed to contain such language at times of war, punishable by imprisonment or deportation. This was followed by the 1918 Immigration Act which explicitly barred foreign anarchists from entering the USA and empowered the Department of Justice to deport foreign activists. Between 1919-1921, a series of arrests were made of suspected communists and anarchists, in a move that became known as the Palmer Raids. By 1920, 27 US states had banned the flying of flags deemed to be communist or anarchist, and 26 states had established laws which legislated against advocating or working towards anarchism or communism including in some instances the prohibition of General Strikes. Thousands of people were cumulatively arrested and deported under this collection of legislation and environment of toxicity. More famous was the second red scare, immortalised through works of literature and film, most notably in Arthur Miller’s The Crucible. In the immediate aftermath of World War II and in the prologue to the Cold War, the onset of Soviet dominance of Eastern Europe, Stalin’s development of nuclear weapons, and the establishment of the People’s Republic of China, US politicians returned to the old habits of the early 20th century. Legislation from 1947 saw President Truman introduce “loyalty tests” for Government employees, enabling workers to have their employment terminated if they were suspected of being “un-American”. Further legislation in 1950 expanded laws regarding deportation and stripped members of communist organisations of their citizenship. Hollywood film companies instituted a blacklist barring suspected communists from employment in the entertainment industry. At the height of the hysteria, Hundreds of individuals, including the likes of Arthur Miller himself, civil rights campaigner W E B Du Bois, and composer Artie Shaw faced infamous trials for their political beliefs. Hollywood film companies instituted a blacklist barring suspected communists from employment in the entertainment industry. While the red scares were the most blatant manifestations of the creation of a frightening “other” in the form of the USSR and Soviet communism, there were undying undercurrents of this phenomenon throughout the Cold War period. Since the collapse of the communism in Europe first through the fall of the Berlin Wall in 1989, and then the dissolution of the Soviet Union in 1991, much of the fear of the “reds” and the Russians has been replaced by a concerted attempt to create a similar enemy across the west in the form of Islam and muslims. Legislation like the US Patriot Act or the so called ban of Sharia Law in Quebec and policies such as the famed “muslim ban” in the USA, the “burqa bans” across numerous European states, or the UK’s Prevent strategy are all part of this process. But 100 years on from the Russian Revolution and some 26 years since the fall of the Soviet Union, we are seeing the ramifications and legacy of such actions . With increasing regularity, the Russian state is being accused of all manner of things related to the global political situation. The 2016 US Presidential election and the ascendancy of Trump; the UK’s EU Referendum, and ultimately, Brexit; the constitutional crisis hitting Spain and the Catalonian independence referendum; and the recent elections in Germany are all democratic processes in which Putin stands accused of meddling in. These major accusations are a small part of the litany of allegations placed at the Russian regime’s doors. So many and regular are the allegations it’s becoming impossible to decipher which of them are probably based in truth and which are complete fabrications. The contemporary Russian scare may not be “red” in nature, but it relies on the century long association of Russia with communism, and the concurrent association with Russian communism as the enemy and the other. Without the Cold War history and context, the threat would appear much less menacing, the narrative much less convincing. Given this context of a modern re-hashing of Russia as the enemy of the west, of capitalism, and of democracy, what will the fallout be? Much of that is still to be written, but don’t be surprised if we see 21st century re-plays of the past. Migration controls, restrictions on freedom of speech and civil liberties, curbing internet freedoms, increases in military spending and interventions, falling back on nationalism, summary justice are all on the cards as a response from Western Governments. But a key element of the response is already being enacted by centre left political figures, media outlets. and political institutions as we speak. With Putin and the Russians standing accused of so much, it’s increasingly easy for those on the centre left to gloss over their failings over the past four decades and lay the blame at Russia’s door as a quick get-out. What that fails to acknowledge is that no matter whether the allegations against the Russian state prove false or true, the underlying causes of the rise in right-wing populism accompanied with its hyper-conservatism, their anti-migrant hatred and their aggressive use of state power is the neoliberal economic consensus which has seen decades of growing inequality, the stripping away of people’s rights and the concentration of power in a corporate elite. The conditions for right-wing populism were laid by this, whether or not its ascendancy was accelerated by Russian interference. By accepting and building this narrative , the centre-left will serve only to ensure its dominance, by failing to understand the material conditions people are facing day to day, and by failing to build a narrative of a better world. Make no mistake, Putin’s regime in Russia is an authoritarian, oppressive regime. Make no mistake that the Russian Government would seek to influence global political affairs by means fair and foul, as all states do. Make no mistake that Russia is undoubtedly guilty of some of the crimes which they have been accused. But, as Adam Ramsay of OpenDemocracy, central to exposing Russian involvement in funding the Leave Campaign describes so eloquently, it’s vital that the centre-left reflects on the role it has played in creating the ugliest political phenomena we see today. The red scares were never really about communist takeover, nor about the USSR, they were about cementing and concentrating power. Today’s equivalent is not about Russian takeover or about the Russian state. Today’s equivalent is all about passing blame and assuaging guilt. The biggest problem for its most vocal advocates, though, is that it will not work.